After an interesting discussion with Jochen Mühlbauer and Hans-Peter Decker of Nomacorc at ProWein, I have been again looking at the subject of closers more closely for the first time since I edited Jamie Goode's article on the subject for Meininger's Wine Business International several years ago. Raised at a time when almost all stoppers were made of cork and then coming of age in a market that chose screwcaps only for its cheapest litre bottlings, I was certainly not one of the first to embrace alternatives. That began to change, though, in the late 1990s as cork taint became a growing concern and I saw numerous otherwise sublime wines ruined by a complacent industry in complete denial. Already companies like Supreme Corq and Neocork were making headway, but their plastic stoppers often made poor closures, not least because they were difficult to remove from the bottle. Nor was every consumer excited about all of the hues in Joseph's multi-coloured coat that were often used to highlight the artwork on the label. About the same time, Australia and New Zealand began to adopt the screw cap and make it, if not fashionable, at the least acceptable to the lay public, especially in Great Britain. Against this backdrop, Nomacorc released its first closures in 1999. With a strong inner core surrounded by softer pieces of extruded foam and made to look like natural corks, I at first found them the least attractive of the alternatives on the market. That has changed. What impressed me at our meeting was to see that the true focus of their business is not just eliminating cork taint but instead oxygen management or, better phrased, teaching winemakers how to deal with oxygen ingress in their wines. Interestingly, much of the problem with oxidation takes place at bottling and has nothing to do with the closures used in the neck of the bottle. 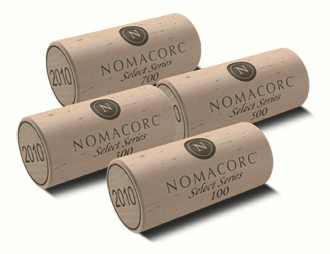 That said, the rate of oxygen ingress in corks do also vary greatly, running from 0.7 to 3.5 milligrams a year and thus allowing three ten year old wines from the same case to mature at vastly different speeds. We all know the adage used when speaking about old claret: "There are no great wines, only great bottles". Although the screwcap industry is now beginning to offer its clients seals with different rates of oxygen ingress, Nomacork already provides its customers not only with a machine to measure oxygen transmission at bottling line, but also a series of four closures: 700, 500, 300 and now 100. Each has its own rate of oxygen ingress so that every individual wine peaks when it should. The word they use for this is 'winemaker intention'. Not only that, the new line look more attractive than the old and - with branded markings and a vintage printed on both ends - almost like a cork.